What you eat during pregnancy is important, as vitamins and minerals pass from you, through your placenta, and onto your baby. Enjoying a healthy, balanced diet during your pregnancy will ensure your unborn baby gets the nutrients they need to grow healthy and strong. Read on to find out what’s considered ‘healthy’ when it comes to your pregnancy diet. Making small changes to your daily diet now will benefit both of you. Even if you’ve always eaten healthily, there are some foods you should avoid and others you should eat plenty of, so it’s a good idea to read up on what you should and shouldn’t be eating during your pregnancy. 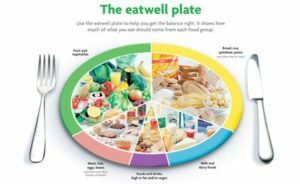 The eatwell plate below can be used as a general guide to healthy eating; it tells you which foods and how much of them you should include. However, during pregnancy, there are some extra considerations to bear in mind. Sweets, crisps, cakes, biscuits, fats, oils, and sugar provide no real nutritional value – only extra calories – so are best kept for occasional treats or replaced by healthier alternatives. If you don’t feel as though you’re eating enough of a particular food group and you’re worried about missing out on vitamins, minerals or other nutrients, speak to your doctor who may be able to help or recommend a safe pregnancy supplement. Our Careline team is here to help too. Call us on 800 6458 6262 (UAE)/ +971 4 420 9489 (Other countries) between the hours of 9am and 6pm Saturday to Thursday, or try our one-to-one online messaging service.